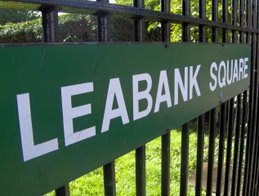 Leabank Square: Olympic Legacy - Leabank Square's Concerns. Sóna, some of the points from the group discussion on the riverbank came across. Of course we would always love more to get printed, but at least we got the main one across. Thanks for doing it. I know you had to take some time off, so thank you very much. My point still didn't make it across tho! When are we ever going to be compensated for all this hell they're putting us through? A gate is not going to help my bike is it? Shame she didn't manage to speak to Mr Roegge while he was in the neighbourhood last week. Why don't you find out from the Olympics PR people if there's a schedule of important Olympic visitors inspecting the Media Centre you could have a chat with? I believe the IOC are very keen on transparency.